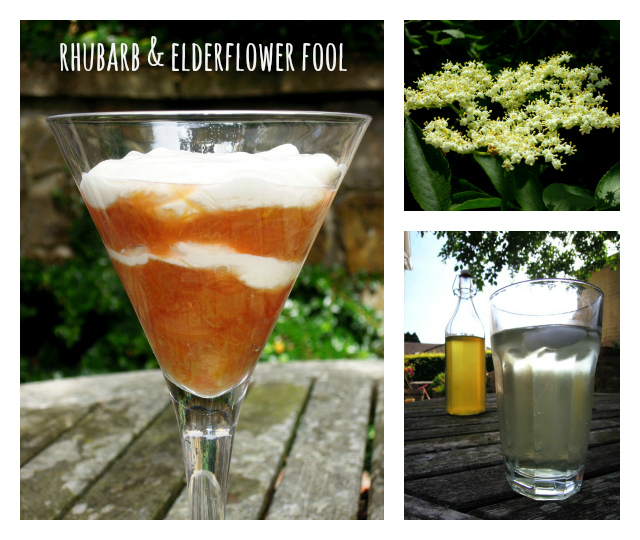 Could there possibly be two more quintessentially English ingredients than rhubarb and elderflower, I wonder? (Now that I’ve written it, even the word quintessentially looks quintessentially English.) For me, these two flavours perfectly conjure up an English summertime and they come together so beautifully in that oh so English of desserts, the anything but foolish fool. My daughters and I picked bags full of elderflowers from the fields at the back of our house a few weeks back and we had a go at making ourselves elderflower cordial for the first time. I can’t believe I’ve never made it before. It’s the most deliciously refreshing of drinks, especially when mixed with sparkling water, which we took to calling elderflower fizz. To use up the last of the cordial I whisked it into double cream and the end result was so incredibly fragrant and divinely delicious I could have eaten the whole lot straight from the bowl just as it was. But instead I combined it with a rhubarb puree to create the most heavenly fool imaginable. Yes, this pudding is most definitely an English summer in a glass. Chop the rhubarb into 1 inch chunks and place in a saucepan with the orange juice and caster sugar. Place over a low heat and bring the rhubarb to a gentle simmer. Cook the rhubarb slowly and stir occasionally until the rhubarb is tender and beginning to fall apart. Remove from the heat before it’s completely turned to mush, and leave to cool before placing in the fridge. Put the double cream and elderflower cordial in a large bowl and whisk until it forms soft peaks. Taste, and whisk in a little more cordial if you think it needs it. Spoon a little of the chilled rhubarb puree into glasses or bowls, followed by some of the elderflower cream. Continue layering until each glass or bowl is full. Serve as it is or perhaps with a little shortbread biscuit on the side. As this is such as superb summer pudding, I’m entering it into August’s Four Season’s Food event hosted by Delicieux and Chez Foti, for which the theme this month is Summer Puds. My tummy is rumbling, and I’m thinking that would make a perfect breakfast. Sadly toast seems much easier and quicker! I think I’d be happy with just the elderflower flavoured cream… but the rhubarb sounds pretty good too! 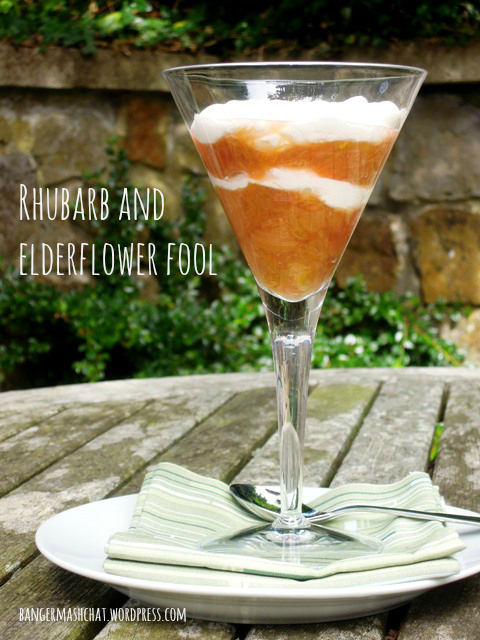 I love the combination of rhubarb and elderflower 🙂 Fool looks delicious! I just LOVE elderflower. Wouldn’t have thought to pair it with rhubarb but now you mention it, it sounds like a match made in heaven. Oh it really is Claire! Subtle but gorgeous! Might need to borrow your elderflower cordial recipe as well as this one…. I fully meant to post the recipe for elderflower cordial while it was still elderflower season but it seemed to have been and gone before I quite got around it it. This recipe on Thinly Spread is practically the same as mine but I didn’t use citric acid, which means it has a much shorter shelf life – not really a problem in our house though!